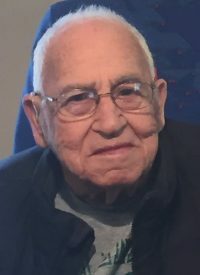 Robert F. “Bob” Hillman – 93 – of 18 Pardee St., Hornell, died early Wednesday morning (September 19, 2018) at his home, following a long illness. Born in Hornell on March 9, 1925, he was the son of Robert C. & Rose Patricia (McCarthy) Hillman and the stepson of Anna (Stewart) Hillman. Bob grew up in Hornell and was a graduate of St. Ann’s School and Hornell High School (Class of 1943). He received his Associate’s Degree in Accounting from Alfred State College; his Bachelor’s Degree from Scranton University; and his Master’s Degree from Alfred University. He also completed certification work at St. Bonaventure University. Bob was a veteran of the US Navy, serving his country during WWII as a Turret Gunner on a torpedo bomber which participated in the invasion of the Philippines at Lingayen Gulf. His ship, the aircraft carrier “The Bismarck Sea” was sunk by two Japanese Kamikaze planes during the battle for Iwo Jima at 6:30 PM on February 21, 1945. Rescued after three hours in the water, Bob was taken to a troop transport at Iwo Jima where he witnessed the American Flag flying over Mount Suribachi the next day. The historic scene was immortalized by the Pulitzer Prize winning photo by Joe Rosenthal entitled “FLAG RAISING AT IWO JIMA”. He was authorized to wear the Combat Air Crewman Wings, the Distinguished Flying Cross and the Air Medal. He was a member of the Royal Order of the Golden Dragon for crossing the International Date Line and survived the initiation from Pollywog to Shellback for crossing the equator. He was employed at the Erie Railroad Accounting Bureau of Hornell and Scranton, PA for 16 years and also as an accountant for the State Workman’s Insurance Fund in Scranton, PA. Bob returned to Hornell and taught Office Practice and Business Machines for the Steuben Allegany BOCES for 24 years and was a member of the BOCES Teacher’s Union. He also served on the negotiation team when it affiliated with the National Education Association. He retired in 1990. Bob was a member of Our Lady of the Valley Parish and a communicant of St. Ann’s Church. He was also a Third Degree member of the Knights of Columbus and a former member of the Hornell Elks Lodge, Hornell Moose Lodge, Hornell VFW and the Hornell American Legion. Bob was a long time member of the City of Hornell Planning Board, resigning in 1998 to spend the winter months in Florida with his wife and son, James. Some of Bob’s particular interests was spending time at a hunting/summer camp that he shared with four other friends & relatives. He also enjoyed gardening and spending time with his friends at the Euchre Club and the Perkinsville Poker Club. He also loved rooting for the New York Yankees and Notre Dame. He absolutely loved spending time with his family, especially his grandchildren. He was preceded in death by his 2 brothers, Leo Hillman and John Hillman. Bob was married on April, 1964 to the former Eleanor Trowbridge who survives. Also surviving are 3 sons, Robert (Janet) Hillman of Bradenton, FL, David (Kathleen) Hillman of Hornell and James Hillman of Florida; 2 daughters, Chris (Jack) Geary of Cleveland, OH and Kim (John) Weyand of Hornell; his sister, Rosemary Walton of Ashville, NC; his sister-in-law, Isabelle Hillman of Hornell; 6 grandchildren, Sara Hillman, Robert “R.J.” Hillman, Heather Hillman, Shawn (Heidi Schmidt) Hillman Jacob Weyand and Spencer Weyand; many nieces & nephews. The family of Robert F. “Bob” Hillman will receive friends on Friday from 4:00 PM – 7:00 PM at the Dagon Funeral Home, 38 Church St., Hornell, NY. A Mass of Christian Burial will be celebrated on Saturday at 10:00 AM at St. Ann’s Church. Burial with full military honors will follow at St. Ann’s Cemetery. Bob’s family request that in lieu of flowers, memorial contributions in his name be made to the Hornell Humane Society, 7649 Industrial Park Road, Hornell, NY 14843. Memorial forms will be available at the Dagon Funeral Home. In recognition of Bob’s service to his country during WWII, the American Flag at the Dagon Funeral Home will be flown at half-staff. God Bless You Dear Uncle! Rest in the arms of God! I am so sorry to hear of the passing of Mr. Hillman. He was a great man and the best teacher I ever had. I still speak of him and his class that I was in from 1969 to 1970. He taught me so much that I have used throughout my life! His class was definitely my favorite year of school !!! So sorry to hear of the passing of this great man. He was one of my favorite teachers back in the 70’s at BOCES and helped get me my first full-time job. At the time I didn’t know he was a veteran. God bless you for your service! A great man with a great sense of humor. What wonderful memories you must have to cherish! God bless you all!